Most swimmers begin the butterfly pull with lateral hand motion away from the body centerline. The sideways motion is a double liability because minimal force is generated and then the arms are in a very weak position (with poor leverage). An effective butterfly pull begins with elbow flexion. Then, the arms immediately move into a position with better leverage. Registration for Camps and Clinics is posted at the STORE. Other clinics are listed on the 2019 SCHEDULE. FREE products at APPROACHING PERFECT. The STR client list includes individual swimmers, triathletes, coaches, teams, camps, universities, associations, national training centers, therapy clinics, and equipment companies. 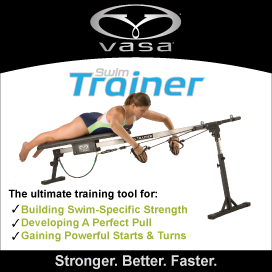 We provide products and services to thousands of swimmers every year as part of our commitment to the sport of swimming. STR is proud to be part of an international effort to apply research and technology to coaching practice. Copyright (c) 1996-2018 Swimming Technology Research, Inc.